Age problems have often been the bȇte noire for generations of students, even among those who are considered above-average in school math. Like trains, speed, and algebra word problems in elementary math, these before-and-after word problems have instilled fear and anxiety among both mathophobic school teachers and parents, who find themselves helpless or clueless in guiding their students and children to solve these non-routine questions. Traditionally, these age problems used to be set in elementary and middle schools—grades 5–10— but a decade ago, at least in Singapore, they started to appear in a few assessment (or supplementary) math books meant for grades 1–2 students, then slowly infiltrating their way in school mid- and final-year exam papers. They tend to appear in Sections B and C of school semestral assessment papers—these last two parts of a Singapore’s school math paper are made up of questions that are often used to discriminate the average from the better math students. Many of these age problems, especially when set in grades 7–10, and which traditionally use an algebraic approach to solving them, can now be posed in lower grades, thanks to problem-solving strategies like the Singapore model method or the Stack method. These visualization methods of solution do away with the abstract (or analytic) methods of solution not formally taught in lower grades, by offering younger students the opportunity to solve these age problems in an intuitive or a creative way. Like most non-routine or challenging word problems, with the right mix of questions tailor-made for students of mixed abilities and with sufficient practice, these questions soon become routine, What at first appears challenging (or frightening?) becomes in the end routine (or even boring? ); however, being able to solve these non-routine questions does indirectly help raise the self-esteem and confidence of many local average math students. Most current assessment math titles contain at most four or five of these age-related questions, often offering only one method of solution; few go broad or deep enough to enable students to practice the different types of thinking skills (or problem-solving strategies) needed to solve a wide range of these age problems. Unless students are exposed to an arsenal of these non-routine questions, most are unlikely to feel confident that they’ve mastered these brain-unfriendly word problems. To meet the mathematical needs and wants of students, teachers, and parents, who wish to enhance their mathematical problem-solving skills, here are two Singapore math ebooks that focus on these age-related word problems: one for grades 1–3 and one for grades 3–6 students, with both titles offering more than one method of solution to solving many of these word problems. Here are some questions taken from the grades 1–2 problem-solving ebook. Can you solve them in more than one way?—No algebra allowed! Four years ago, Amy was 8 years old, and her sister was 13 years old. How old will her sister be when Amy is 18 years old? Ian is 5 years old. His mother is 23 years old. In how many years’ time will his mother be 3 times as old as Ian? Beth will be 7 years younger than her brother in 5 years’ time. Beth is 12 years old. How old is her brother? My grandfather is 61 years old. My father is 25 years old. I am 5 years old. In how many years’ time will the sum of our ages be 100? Mr. Jones is 12 years younger than Mr. Jack. The sum of their ages is 68. How old is Mr. Jack? Aaron is 11 years old. His dad is 47 years old. How many years ago was his dad five times as old as him? Valerie is 11 years old. When she asked her mum about her age, her mum replied, “When you reach my age, I’ll be 67 years old.” How old is the mother now? 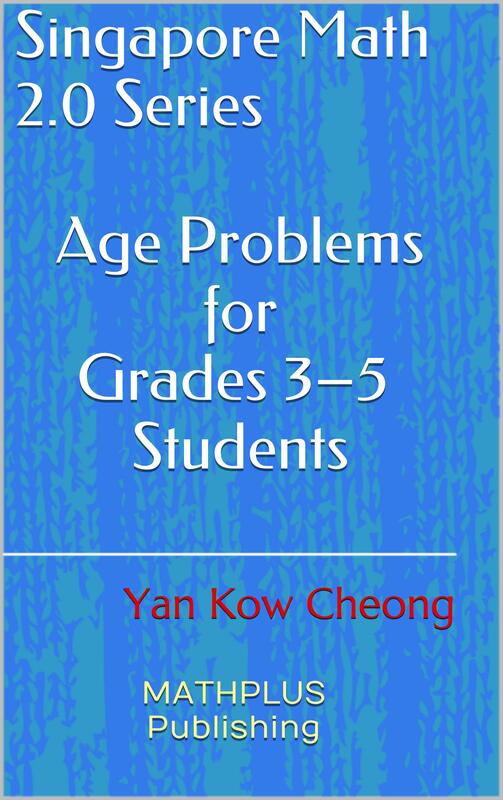 Below is the ebook cover of the grades 1–2 problem-solving title that explores more on these age problems, by providing a number of problem-solving strategies and heuristics to solving them, with a focus on the Singapore model (or bar) method. Here are some age-related questions extracted from for the grades 3–6 problem-solving ebook. Try to solve these word problems in as many non-algebraic ways as possible—e.g., using bar and stack methods, and Sakamoto method. 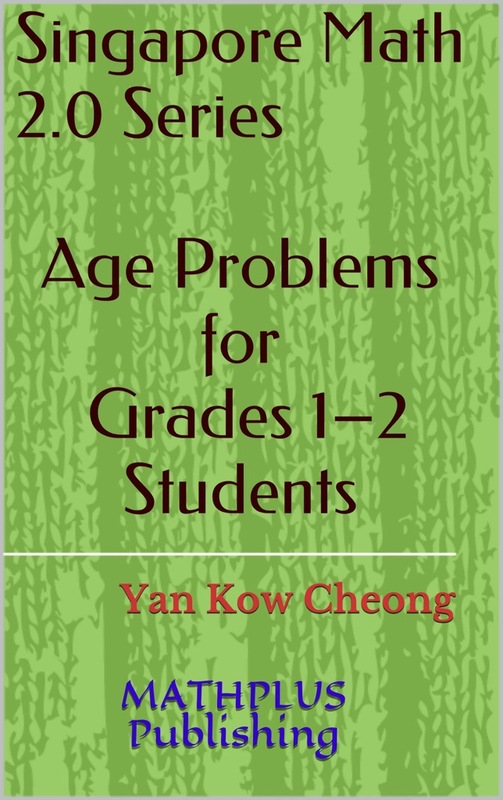 Probably the best value-for-money ebook on Singapore math, focusing on age problems, you could find in the market! Coming SOON on Amazon.com! This year Robert’s age is between 30 and 60 years old and is a multiple of 6. Next year, his age will be a multiple of 7. How old is he now? The total age of a father and his two sons is 54. Twelve years later, the age of the father is 4/5 the total age of his sons. How old is the father now? Five years ago, Mr. Smith was 6 times as old as his son. In 3 years’ time, he will be 4 times as old as his son. How old is Mr. Smith now? Mrs. Tan is 4 times as old as her son. In 20 years, she will be twice as old as her son. How old is Mrs. Tan now? Ten years ago, the ratio of Mark’s age to Tom’s age was 5 : 2. The ratio is now 5 : 3. What will be the ratio in 10 years later? Regardless of your age, keep mentally young by having fun with these age problems! Indeed, solving them in more than one way every now and then could be an inexpensive prevention from any form of schizophrenia or dementia. © Yan Kow Cheong, July 24, 2014. This entry was posted in Singapore Math, Singapore Publishing and tagged Age Problems, bar method, Before-and-after grades 1–2 problems, Before-and-after grades 3–5 problems, Before-and-after Singapore word problems, creative problem solving, Draw a diagram, Grades 1–2 Singapore math problems, Grades 3–5 Singapore math problems, Intuitive method, math contest, model drawing, olympiad math, problem-solving heuristics, problem-solving strategies, Sakamoto method, Singapore bar method, Singapore math ebook, Singapore math Kindle book, Singapore math publishing, Singapore model method, stack method, time problems, visualization on July 24, 2014 by Yan Kow Cheong. Hi! I’m Nystrom. Our son hopes to read French and Spanish at Oxford and I am about to arrange French lessons and Spanish tutoring for him with bespoke languages tuition. I’ve heard that their Spanish tuition is excellent. Can anyone confirm if their French tutoring is as effective as their Spanish tuition? The site looks really very good, but I’ve heard nothing about their Spanish tutoring! Advice really appreciated! It’s difficult to know from a website alone!